Our DJ platform package has everything you need to put on a great show. Elevate yourself above the crowd and have visibility into your audience! There is still plenty of room for you, your gear, or anyone else you want to invite up onto your stage. 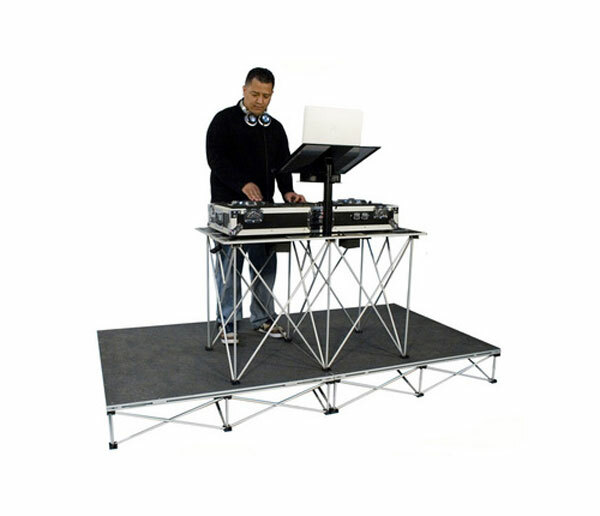 Our RRDJPAK8 includes two 4'x4' carpeted platforms with matching 8" high collapsible risers and a 30" tall folding table to hold all your gear. Platforms support up to 185 lbs/sq ft - that's almost 5,900 lbs! Table specs: Table top surface measures 48" long x 24" wide and supports up to 2,200 lbs! Quick and easy setup (approx 5 minutes) allows you to spend more time playing music rather than setting up your gear. When it does come time to disassemble - everything folds down for easy transportation and storage. The entire system can fit in your car! See alternate picture for disasembled system: two 4' x 4' platfroms, 2 risers and folded table.